Tangled for the LeapReader is another great book from LeapFrog. The book includes the story as well as games along the way and at the end of the book. 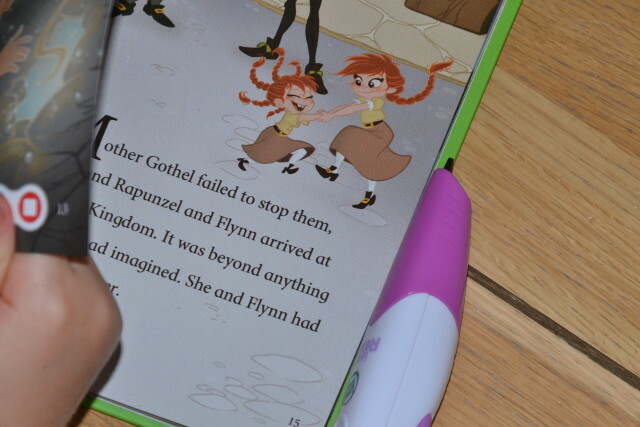 I love that as well as reading the story if you press different parts of the pages the characters talk or music plays, the whole book really comes to life with LeapReader. Some of the pages have questions about the story that’s just been read, so we’ve been using these to test whether the children have been listening and even to see how much they’ve taken in when reading the story by themselves. My 4 year old loves the independence the LeapReader gives her to listen to a story by herself while my 6 year old very much enjoys the games and questions. Which is your favourite LeapReader book? Did you know LeapFrog® have just unveiled the brand new Imagicard™, a ground-breaking Digital and Physical Learning Experience which brings characters to life with the snap of a picture from one of 30+ interactive collectible cards on the All-New LeapPad™ Platinum. The all-new LeapPad Platinum has a seven-inch high-resolution, multi-touch capacitive screen and fast processor, as well as being extremely durable and with the usual kid safe content you expect from LeapFrog. We have an older model LeapPad so are very pleased Imagicard is backwards compatible with all LeapFrog LeapPad™ tablets with the exception of LeapPad™1. LeapFrog Imagicard (RRP £19.99 per game, for children three to eight years old) will be available online and at major retail locations in August 2015. The LeapPad Platinum tablet (RRP £99.99, for children three to nine years old) online and at major retail locations in July 2015.